Canadian winters in Ontario can be brutal, particularly for those who commute daily, whether in a motor vehicle, as a pedestrian, or cyclist. From weather data collected between 1981 and 2010, it snows on approximately 45 days for a total of 155 cm annually in the Milton area. Surprisingly, the number of vehicle collisions resulting in injury generally do not increase during the winter months in Ontario, according to the Ontario Ministry of Transportation; in fact, these numbers decline somewhat. We can likely attribute this statistic to generally good winter road maintenance in Southern Ontario and the fact that drivers usually adjust their driving practices accordingly, when the roads are icy and snowy and when visibility is reduced. In most winters, there are a number of inclement days on which the number of motor vehicle collisions seems to skyrocket. Sometimes drivers and passengers are involved in a collision and sustain serious injuries resulting from poor driving conditions despite their efforts to drive carefully. In such cases, deficiencies in salting, sanding or clearing roads may be the reason for these events and the municipality or jurisdiction responsible for maintenance may be held accountable. One such incident occurred on April 1st 2003, and lead to the trial of Giuliani v. Region of Halton, 2010. Ms. Giuliani was 39 years old when she lost control of her Honda CRX on Derry Road and hit a vehicle driven by Dr. Delle Donne. The road was snow covered and icy. Ms. Giuliani was initially taken to Milton Hospital, then transferred to Sunnybrook for further assessment. The doctor described her injuries as extensive and life-threatening. Her injuries included intra-abdominal injuries which required urgent surgery, multiple fractures to her legs and collarbone, multiple rib fractures requiring a left chest tube, and injuries to her spleen and bowel, which led to removal of her spleen and part of her bowel. After extensive rehabilitation and rest, Ms. Giuliani was finally able to return to her employment in June of 2006, but was receiving accident benefits at the time of the trial in 2010. Ms. Giuliani brought a suit against the Town of Milton and the Regional Municipality of Halton, charging that they failed to maintain the roads in a reasonable state of repair, which resulted in her accident and the resulting catastrophic injuries. On the day of this collision, there were 9 accidents in Milton attributed to snowy conditions and a loss of control. The afternoon before the incident, Environment Canada forecast subzero temperatures and 2 cm of snow with a 80-100% chance of snowfall, which is their highest probability. In response to observing about 2-3 cm snowfall at 6 a.m. on the morning of the 1st, salting operators were called and asked to begin work before their regularly scheduled 7:30 start time (which was criticized at trial as a late start under the circumstances). Milton road maintenance management decided not to clear the snow from Derry Road, but only to salt the road in order to create a ‘brine mixture’ which would result in melting and eventually, clear pavement. At the time of the accident, the snow had already been compacted and had become icy in some locations. Under the Municipal Act, 2001, Municipalities are required to maintain bridges and highways in a reasonable state of repair under the circumstances, and are liable under the Negligence Act for damages or injuries to individuals that occur because they failed in their obligation. Derry Road is part of the Regional Road system, but a 2001 agreement placed responsibility for road maintenance on the town of Milton, according to the standards laid out by the Region. The Performance Standard for salting requires that road salt be applied according to a ‘Winter Control’ Standard to provide as safe a driving condition as possible. Winter road patrols are mandated to check the roads from the beginning of December to the end of March, but not prohibited after that date. The Performance Standards for the region define Derry Road as a class 1 road, and as such, it should be kept as bare as possible. At the time of the accident, Ms. Giuliani admitted to driving 60 km/hr. She also admitted that previous to the incident, she lost some control of her vehicle but then later regained her speed. A driver behind her admitted that the very slippery conditions made it difficult to maintain this same speed, as well. The judge concluded from this that Ms. Giuliani’s failure to adjust to a slower safer speed was a contributing cause to the accident. The judge ruled that the Town of Milton failed in its contractual obligations to the Region of Halton, to maintain Derry Road at a reasonable level of safety, thereby holding the Town of Milton liable for all damages that result from this case. Damages for Ms. Giuliani’s injuries were assessed at $750,000, but because she was determined to be partially responsible, Ms. Giuliani was awarded $375,000 payable by Halton Region to be reimbursed by the Town of Milton. Just as property owners have an obligation to maintain their land and buildings at a reasonable standard of safety for all users, the various levels of government that maintain our roads, parks and buildings in Ontario must also meet quality, maintenance and construction standards that ensure safety under reasonable conditions. 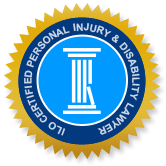 If you or someone in your family was seriously injured in an accident resulting from the likely negligence of another party, you have a right to compensation. Call the Milton Injury Lawyers of Ontario (ILO) law office today to determine whether you have a possible claim for damages and what steps can be taken to achieve justice for you. Your initial consultation is free and can be held at the hospital or your home if you are unable to meet in our office.